Ah, yes, you know you've returned to Israel from being abroad when you spot a sign that just goes too far. 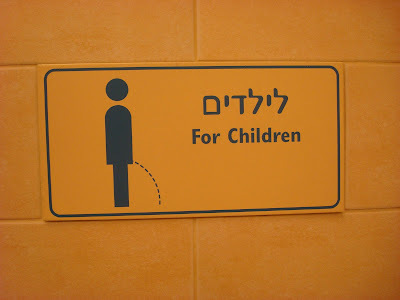 I spotted this sign while using the bathroom at the Tel Aviv airport. There was a row of normally situated urinals, and then a smaller urinal positioned much lower. For you ladies unaware, this is a fairly common sight in male bathrooms in high traffic locations. I'm not so sensitive that something like this bothers me, but I just have to wonder if the guy was smirking as he sent this design off to the printers. I mean, honestly, did he think that I would have any problem figuring out that the miniature urinal sitting less than a foot off the ground was meant for anything else than a child? The guy who designed this was laughing when he did it, right?